ANAHEIM — The tough choices have all been made for the 81st All-Star Game. Now comes the fun part. 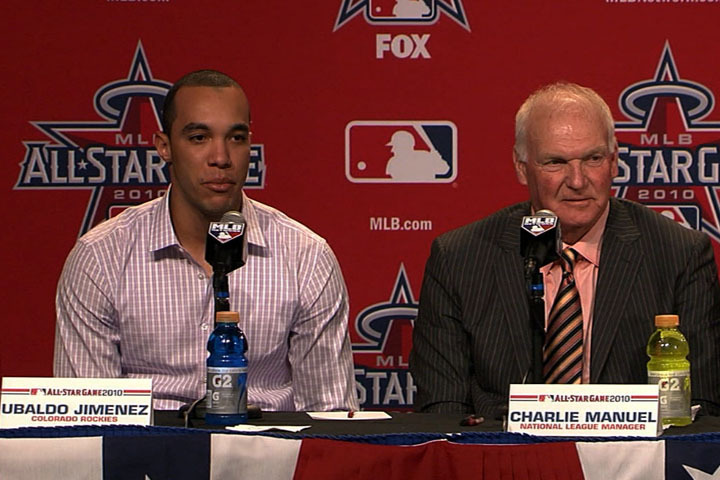 Under the bright lights of the Anaheim Marriott ballroom on Monday morning, American League manager Joe Girardi and National League skipper Charlie Manuel made their tough calls a matter of record, revealing the starting pitchers and starting lineups for Tuesday’s Midsummer Classic. It will be left-hander David Price starting for the AL against right-hander Ubaldo Jimenez of the NL in a matchup of young aces. And the lineups are stacked, as usual. So stacked that Carl Crawford of the Rays, the Majors’ leading run scorer so far this season with 70, is hitting ninth for the AL, and NL RBI co-leader Corey Hart of the Brewers is batting eighth. Now it’s set. Let the game begin. The 81st Major League Baseball All-Star Game will be televised nationally by FOX, in Canada by Rogers Sportsnet and Sportsnet HD and Le Reseau des Sports, and around the world by Major League Baseball International, with pregame ceremonies beginning at 8 p.m. ET. ESPN Radio will provide exclusive national radio coverage. MLB Network, MLB.com and Sirius XM also will provide comprehensive All-Star Game coverage. But this is serious business. The winning league gets home-field advantage in the World Series. Girardi’s toughest calls were in the lineup, where he balanced 2010 numbers with career contributions and came up with the Mariners’ Ichiro in the leadoff hole, followed by Yankees veteran shortstop Derek Jeter hitting second. That meant Crawford, the speedy two-hole hitter for the Rays, fell all the way to ninth. At least Girardi’s choice to start was clear. Price, 24, leads the AL at the unofficial halfway mark with a 2.42 ERA and is tied for the league lead of 12 wins with Yankees lefty CC Sabathia. Girardi might have been tempted to tab his own guy in Sabathia, but he was barred from doing so by a rule that says pitchers who start the Sunday before the All-Star break are ineligible for the game. Manuel had a tougher call between Jimenez, the early-season sensation who pitched a no-hitter for the Rockies and leads the Majors with 15 wins, and Marlins right-hander Josh Johnson, the steady workhorse who entered the break with an NL-best 1.70 ERA. The Cardinals’ Adam Wainwright also may have gotten the nod in a different season, with 13 wins and a 2.11 ERA at the break. Manuel faced some lineup conundrums of his own. His starting outfield includes a left fielder in Ryan Braun of the Brewers and two right fielders, Andre Ethier of the Dodgers and Braun’s teammate, Hart. Manuel tabbed Ethier for center field. Either has played 436 Major League games in his career but has never appeared in center. Considering the depth of pitching on the NL roster, those outfielders might be idle in the early innings. At least that’s Manuel’s plan.